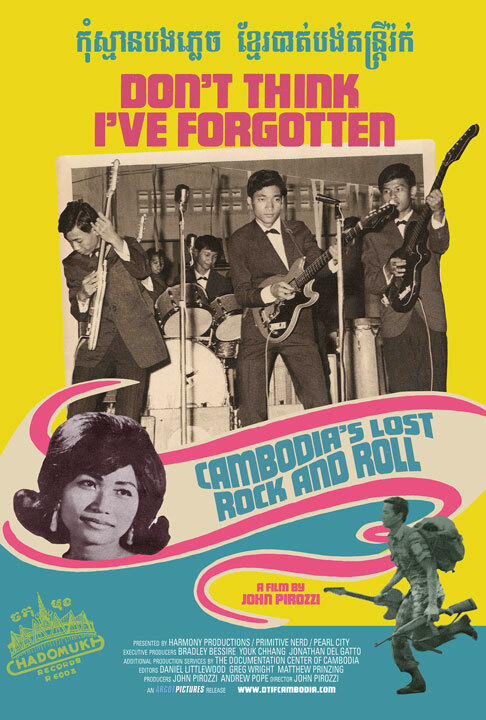 Don't Think I've Forgotten: Cambodia's Lost Rock and Roll is among the competitors for the 2015 Academy Award documentary film section. Literature and Science, Writing-to-Learn Colloquium, College of Mount Saint Vincent, Urban sociology is concerned with the origin, development and evolution of cities as well as with the description and comparison of urban life and cultures. In this colloquium I presented a new method for teaching urban sociology. Student groups were assigned a neighborhood park and asked to research its history, culture, environment, demographics, recreation/leisure, arts/culture, and transportation, with a focus on urban design and contemporary use of urban space. They developed a profile of the park and practiced writing about a public space. April 23rd, at Christian Berst Art Brut, 95 Rivington Street, New York. Original Album Covers on Display with artefacts from the documentary film Don't Think I've Forgotten: Cambodia's Lost Rock and Roll. 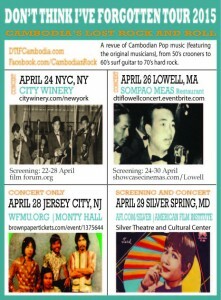 Special Guest DJs playing rare Cambodian records. Podcast with the International Center for Transitional Justice is an international non-profit organization specializing in the field of transitional justice. Also this coming thursday we are having our soundtrack release party: we will have DTIF wine sampling and album covers exhibited then! Hope that some of you can make it. We are also having a mini East Coast tour. The year 2015 is significant in genocide history. It is the 100th Anniversary of the Armenian Genocide, the 70th Anniversary of the end of the Jewish Holocaust, and the 40th Anniversary of the Cambodian Genocide. Artists featured in the art exhibition are well-known painters, sculptors, textile artists, and collectors specializing in this genre. 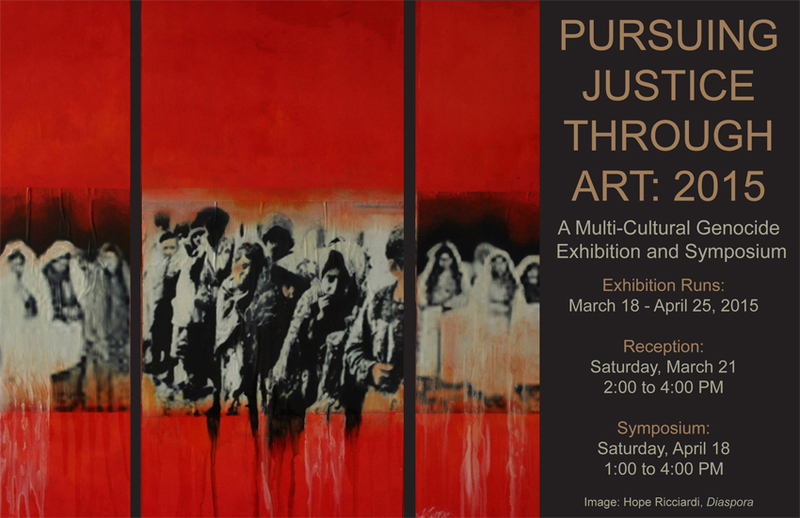 They include: Mohammed Ali and Al Asadi, Gagik Aroutiunian, Bayda Asbridge, John Avakian, Ani Babaian, Stephen Clements, Ellen Davison, Adrienne Der Marderosian, Dave Drinon, Charlotte Eckler, Amy Fagin, Fanardjian (loaned by Stephen Dulgarian), Lynne Foy, Gillian Frazier, Charles Gallagher, Mary Hart, James Higgins, Raymond Howell (loaned by Eve Soroken), JoAnn Janjigian, Andrew Ellis Johnson, David Jones, Lucine Kasbarian, Mico Kaufman, Chantha Khem, Puthearith Kret, Sandra Lauterbach, Markus Lewis, Adam Mastoon,Talin Megherian, Crissie Murphy, Ruth Naylor, Marsha Nouritza Odabashian, Judith Peck, Dany Pen, Sandra Presley, Bill Reedy, Hope Ricciardi, Jennifer Rocco Stone, Alain Rogier, LinDa Saphan, Susanne Slavick, Jessica Sperandio, Rose Sielian Theriault, Nora Tang, Sopheap Theam and New England Quilt Museum's Community Quilters, Rita Thompson, Robert Thurlow, Holly Tomlinson, Carol Vinick, Denise Warren. 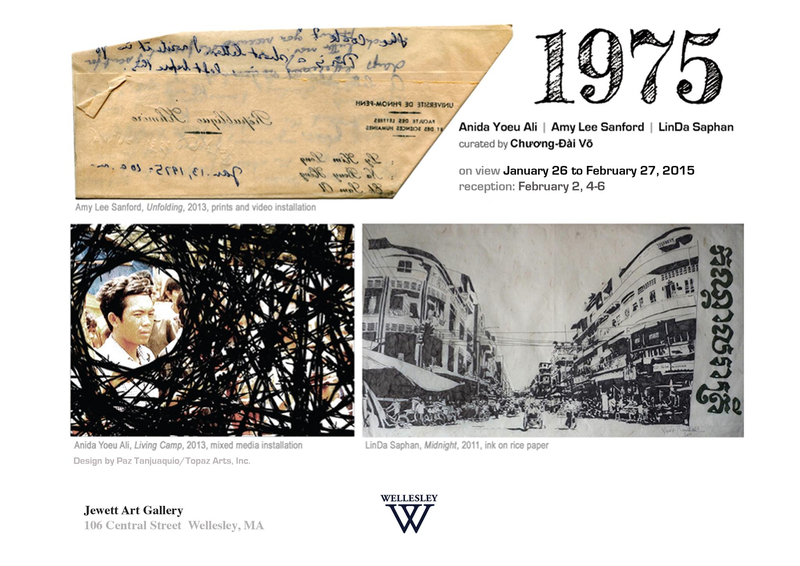 Jewett Art Gallery at Wellesley College presents 1975, a group exhibition curated by Chương-Đài Võ, featuring works by Anida Yoeu Ali, Amy Lee Sanford and LinDa Saphan. This exhibition brings together three diasporic Cambodian artists whose works engage with war, memory, displacement and globalization. Anida Yoeu Ali’s silk screen prints and video installation recall life in a refugee camp following the fall of the Khmer Rouge. Amy Lee Sanford’s video and photographs share with viewers the process of uncovering a difficult history, the turmoil of the late 1960s and 1970s, as told in letters written by a father she never knew. LinDa Saphan’s drawings of apartment buildings and architectural monuments in current-day Phnom Penh hint at the costs of urban development and global capitalism. April 24nd, 2015 at the City Winery in NYC. 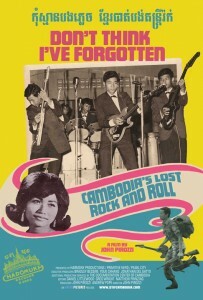 Cambodian's music history will be redeemed. This coming April is Khmer New Year and marks the 40th anniversary of the Khmer Rouge take over of Cambodia. The significance of this timing should be recognized as we create a great opportunity for the Cambodian musicians to share their stories and music with the world.